This section provides a tutorial example on how to monitor the status of each thread in timeline or table format. To monitor the status of each individual thread, you can use the Threads tab on Java VisualVM. Timeline - Display status history of each thread, using different colors for different statuses. Table - List all threads with their status statistics. Details - Displays each thread with more detailed information. 3. Wait for some time, and click on the Timeline tab. You will all threads in the LongSleep.java. The "main" thread is sleeping as expected. But there are 4 threads always running: RMI TCP Accept-0, Attach Listener, Signal Dispatcher, and RMI TCP Connection(4). 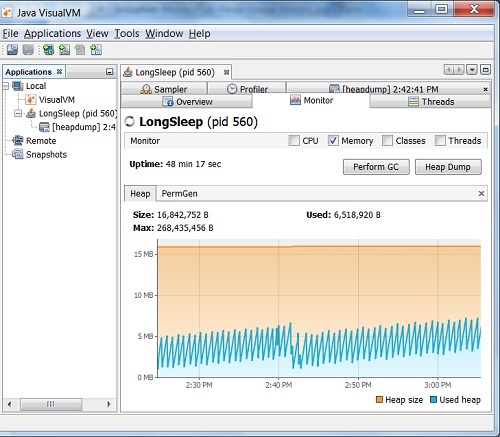 I guess there are running to serve monitoring requests from this Java VisualVM.